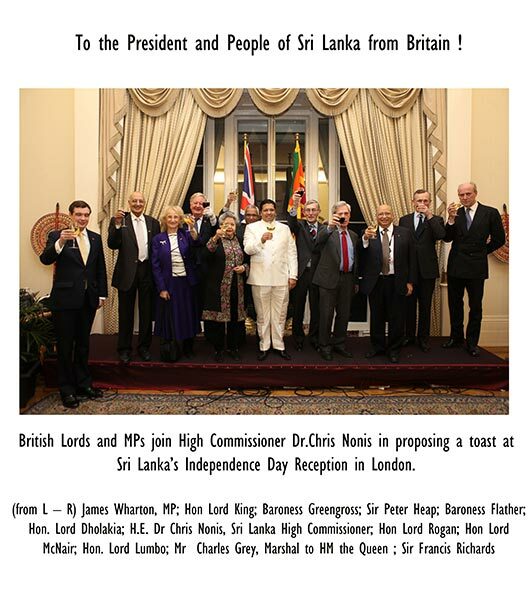 To the President and People of Sri Lanka from Britain ! High Commissioner for Sri Lanka to the UK, Dr Chris Nonis called on Britain to replenish the tremendous reservoir of goodwill it has with Sri Lanka, stemming from the antecedent history between the two countries. He articulated that both our countries have a rich and varied plurality of economic, cultural, and linguistic traditions, and we should draw more deeply on the strength of our shared heritage, harness our collective strengths, and leverage on our commonalities. He was addressing a large gathering of the British polity including Members of the House of Lords, Members of the House of Commons, London-based High Commissioners and Ambassadors, as well as senior officers from the Foreign and Commonwealth Office the Commonwealth Secretariat, International Institutions and well-wishers at a reception held at the Sri Lanka High Commission in London to celebrate the 64th Anniversary of Independence of Sri Lanka. Dr Chris Nonis proposed a toast to Her Majesty Queen Elizabeth II, in her Diamond Jubilee year, and the people of Britain. Mr. Charles Gray KCMG, Marshal to Her Majesty Queen Elizabeth II, in proposing a toast to the President and people of Sri Lanka, reiterated the longstanding connections we have between the two countries, and congratulated the country on the peace and calm that now prevails in the country after so many years of difficulty. He reiterated the close working relationship Britain has with the new High Commissioner, and expressed confidence that the friendship and understanding would continue for the years to come. Dr Chris Nonis, in his address, also highlighted that after 28 years of conflict perpetuated by terrorism, Sri Lanka finally achieved peace under the leadership of His Excellency the President Mahinda Rakapaksa, and now has a historic opportunity to make that transition from developing to developed Nation. He articulated that the speed of this transition will depend not only on the indigenous communities of Sri Lanka, but also on the Diaspora, the British and all the international communities, many of whom were represented at the reception. 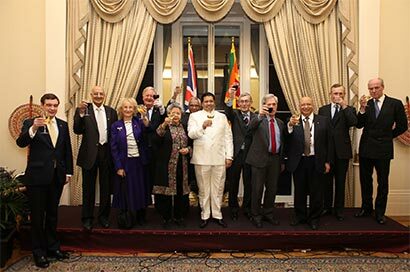 Dr Chris Nonis said he was heartened by Prime Minister David Cameron’s new thrust of Economic Diplomacy, which was also reechoed by Foreign Secretary William Hague, and that therein lies an opportunity for the UK-Sri Lankan relationship. Presenting succinctly the very real post-conflict progress Sri Lanka has been making, Dr. Nonis highlighted the indices that bear testimony to the country’s extremely conducive macroeconomic environment and invited the British community to take advantage of these opportunities. Dr. Chris Nonis called on all those in the international community to visit Sri Lanka, so they may make a fair, objective and impartial analysis of the country’s post-conflict progress based on facts not fiction. He reiterated the imperative of not being influenced by covert pressure from lobby groups veiled in the cloak of legitimacy, but who are in reality demagogues of division, and only serve to retard the very comprehensive reconciliation process going on in Sri Lanka. He also invited guests to view the exhibition at the High Commission premises which depicted the comprehensive rehabilitation, reconciliation and reconstruction programmes in the conflict affected areas of the North and East , as well as key developments in the South, which reflect the country’s renaissance in the post-conflict era. Children representing all communities living in Sri Lanka, were dressed in their traditional costumes in the High Commission premises and a group of them entertained the audience to a song on national unity and harmony, sung in Sinhala, Tamil and English. 2 Responses to To the President and People of Sri Lanka from Britain ! You make a pretty picture Mr Nonis, treating mad dogs and englishmen with SL taxpayer sponsored alcohol. You did good job collecting a group of tottering fossils from the dead British aristocracy. The Global Tamil Forum, Mr Nonis, is working under your legs drafting resolutions and printing stamps. You stick to your fossilised friends and grandiose pictures Mr Nonis, whilst the tamils write the resolution that is comimg up and print more stamps with the tiger emblem. Nonis looks bloated up within a few months of being the high commissioner in London. Enjoying himself to the maximum, you luck guy! When Dayan and Shavendra in his cool sunnies can enjoy at tax payers expense why not you.